» How to create input and message boxes in a Word document? Last update: March 2019; applicability: Office 365,2019, 2016, 2013. Sometimes, we need to make our Word documents interactive and capture some user input. For that we typically use both message and input boxes . As the name suggests a message box is a piece of information that is displayed to the document users. Input boxes are instrumental to capture information from the user. This post has all the information and code you’ll need to create fully functional documents with VBA message and input boxes for Word. How to add VBA code into Word? Before we go ahead and explain how to add message and input boxes, here’s a quick refresher on how to add VBA code to a Word document. First off, go ahead and enable the Developer tab. Now, hit the Visual Basic button from the Developer tab. This will open the Visual Basic Editor. 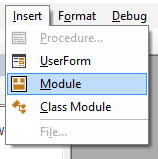 Click Insert and then select Module. Copy the code we provide below into the Module you just created into your module. Click on Save. Provide a name to your document if prompted. Required. It is the information that can be given to the user. It should be inserted inside the double quotation mark. Optional. Buttons are those kind of buttons that are given to the users information. There are various buttons available for MsgBox() and they can be found on the pictures below. Optional. It is the title for the information given to the user. If not given, Microsoft word will be the default title. Optional. Context is numeric expression which is used to identify the help topic by the unique number. 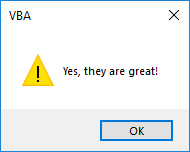 MsgBox "Hi, Visual basic is easy to work with", vbExclamation, "VBA"
MsgBox "Yes, they are great! ", vbExclamation, "VBA"
MsgBox "Why not? They are great! ", vbCritical, "VBA"
Input box is used to get information from the user. Let us discuss about it with an example. Optional. It displays the default value inside the text box, before user types for a value. If not specified, the text box will be empty. Optional. HelpContext ID is the id number for the help file.